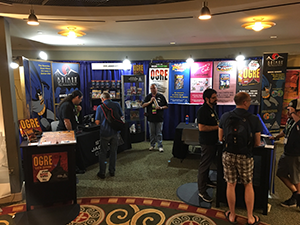 We're back in the office after a great trip to BGG.CON 2016. Andreas, Ariel, Guy, Jimmie, Randy and I set off on our journey Wednesday morning. After a brief rest at the Czech Stop, we were on our way again! When we arrived on site, we all pitched in, set up the booth, and relaxed afterward by (how else?!) playing a few games. Thursday morning, we were ready to go! We had a super time talking to lots of wonderful people, showing off Batman: The Animated Series Dice Game and Ogre Sixth Edition (for a look inside the box, check out our unboxing). We also had plenty of people interested in Simon's Cat Card Game, Bill & Ted's Excellent Boardgame, and I Hate Zombies. This was my first time at BGG.CON, and while BGG.CON Spring was busy, it was dwarfed by this one!! The convention staff did a great job keeping everything running like clockwork. The dealer rooms were well laid out, so there was plenty of space for people to walk around and see all the cool things the vendors had. Friday was another good day, with lots of people stopping by to say "hi!" and check out our new games. The signup board was posted Friday for Saturday night's I Hate Zombies Horde Game. 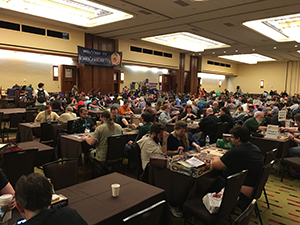 Saturday was the last full day at BGG.CON 2016, and people were making the most of it in the dealer room, playing demos and deciding which games to take home. After the room closed, everyone gathered in the gaming hall for the closing ceremony and drawings. Lots of people went home with some great prizes, including game bundles, a gaming table, AND a trip to Essen Spiel! After the closing ceremonies, it was time for the I Hate Zombies Horde Game! We got set up, determined who was human and who was a brain-eating zombie, and we were off! The players were enthusiastic, and humanity gradually gained the upper hand. The humans were able to save the day, and the zombie horde was eradicated. The surviving human players received prizes to thank them for saving humanity. As we were wrapping up, another group arrived. They wanted to play, so we gave them their player cards, went over the rules, and another game was on! It was hard fought, with both humans and zombies falling like flies. Eventually, it came down to one human player and three zombies remaining in the game. The human put up a valiant fight, managing to take down two of the zombies before the last one finally prevailed. It was an epic battle. We all had a great time! Sunday was another good day. We visited with many of the attendees and helped them make their last-minute purchases. 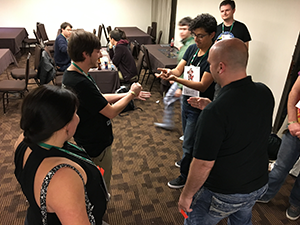 It was a great event, and we all had a good time demonstrating our games, along with trying out some great new ones. I can't wait until next year's show!